Great drinks, a buzzy atmosphere and a pumping downstairs nightclub make this a hotspot for a fun-loving crowd and neighbouring City folk. The fact that Gerry Calabrese is one of the names behind this venture was reason enough for us to visit. As the son of Salvatore Calabrese, one of the cocktail world’s most renowned barmen, we wanted to discover his take on the family tradition. 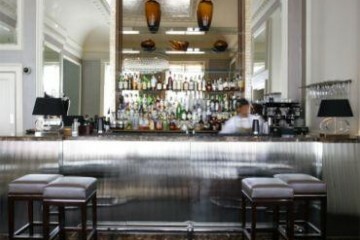 Unlike the smooth, very grown up operations his father heads up, this place is designed with party people in mind. Nothing wrong with that. In fact, we’d say it’s probably a good thing so as to avoid direct comparisons. He’s partnered up with Andy Pearson (current UK Bartenders Guild National Champion and the delightful face behind our TCL Cocktail Of The Month demos) to create an array of fresh, modern, exciting drinks featuring organic British produce wherever possible. Oh, and all syrups, purees and compotes are freshly made on the premises. It might be virtuous in some respects but don’t confuse that with being at all boring. Low key and intimate are words that don’t feature in the Pony’s vocab, instead the location, decor, innovative drinks menu and pumping dance floor downstairs are about as playful as a bar is likely to get. 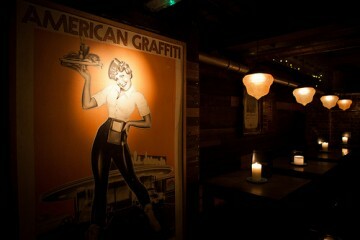 The Pony is different to most of Hoxton’s hot spots as it doesn’t set out to appeal to the local style victims. We like that. A lot. Instead you’ll find groups of City boys, a whole heap of girls and people like us purely looking for somewhere upbeat to round up the week. Ms S came over all patriotic as she gleaned the menu – it’s filled with all manner of exciting London-inspired drinks. East End Promise and East End Punch were both tempting but in the interest of research and locality it had to be the signature of The Curtain Road. The ingredients speak volumes about the creative use of fresh ingredients from the team behind the bar: gin, fresh cucumber, elderflower liqueur, bay leaf, juniper and citrus are a match made in bar heaven. Ms S waxed lyrical about the freshness of this light, delicious drink saying that its clean, delicate flavours were given essential ‘oomph’ with the surprising and delicious taste of bay leaf. Tanqueray was the recommendation gin-wise, but as is so often the case Mr G found that it was the detail that made the defining difference. His Martini was good and cold, stirred with a little Noilly Prat, but there was to be a twist in the tale – the twist being one of grapefruit rather than of lemon. This nifty variation sat very well with the Tanqueray and took the taste to a different direction. It made for a Martini which somewhat strangely lacked much of an aroma. However, the first taste was as beautiful as it was surprising. All in all it was a deliciously sharp and very pleasingly dry drink. A slight but respectful variation on the classic. Nice going. For once Ms S and Mr G combined forces, opting for the extra special Hoxton Tea Party. Forget any notion you might have of chintzy crockery and builders brew, this is strictly for those who like their tea on the strong side. By that we mean nudging on 40% proof… This most British of rituals takes on a very different guise in this neck of the woods with an impressive self-cooling infusion jar taking the place of a rinky-tink china pot and gin or vodka substituted for tea leaves. Talk about stylish… We went for the Spring PicNic (Tanqueray gin, pears, thyme, Lurgashall ginger liqueur and lemonade), recommended for a minimum of four, but three of us managed to polish off the lot. We’re not proud of ourselves, really we’re not but in our defence, it was pretty easy to do. For starters, the drink is deceptively sweet and decidedly moreish. And the fact that you get to play dinner lady by pulling the tap on the infusion jar is reason enough to get carried away. We had a fine old time sipping from our teacups, cocking our little fingers like proper East End toffs. Like any good tea, this one is served with an assortment of sandwiches and dainty cakes. Great fun and highly recommended for small parties. Full meals are offered at lunchtime but in the evening the bar menu focuses on mini takes on British classics. As well as (sustainable) fish and chips, sausages and mash and a selection of pies, there are fish fingers and dips and jellied eels. Sunday makes way for the essential Sunday Joint. The inventive monthly changing cocktail menu and the ingenious Hoxton Pony Tea Parties – a must for any credible Hen Party. 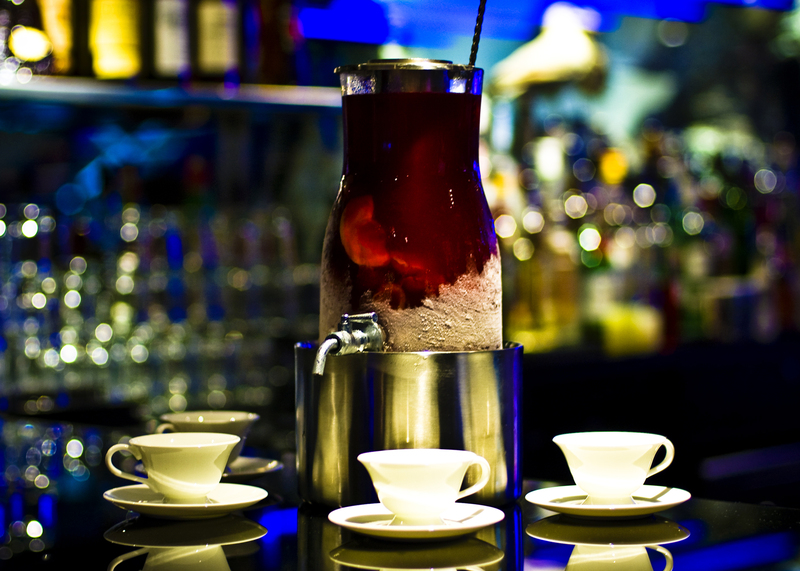 We love the sparkling tap water while party people will appreciate the full-on club nights in the basement bar. About right for what you get. Average price for cocktails about £7.50, for food under £10. This is more of a party place, particularly suited to hen or stag nights or mixed crowds out for a good time. That said, the cocktail list is pretty damned serious; if you’re into your drinks, get here early and engage with the bar staff. It’s loud, it’s fun, the bar food is lovely and everyone is up for enjoying themselves. Throw in a very original drinks menu and you’re in for a good night.